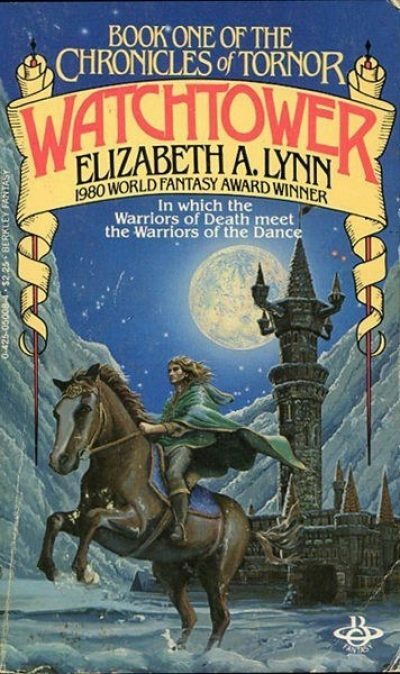 1979’s Watchtower is the first volume in Elizabeth A. Lynn’s Chronicles of Tornor. Most of Tornor Keep’s defenders died in a futile attempt to bar invaders led by Col Istor. Knocked out cold early in the battle, the armsman Ryke was spared. Not out of charity. Istor respected Ryke’s abilities and preferred to keep him alive and useful. Not that Istor wholly trusts Ryke, but he does have leverage. That leverage is Errel, heir to the late lord of Tornor Keep. Errel lives only as long as Ryke serves Istor. At that, Errel survives only as a “cheari” or jester. Tornor Keep is only Istor’s latest conquest, not the most important or the last. Istor plans to conquer the whole of Arun. Istor is not hasty, however; he takes time to absorb each new piece of territory before moving on to the next. To that end, he agrees to Cloud Keep’s offer of truce. It will give Istor time to make certain of his control of Tornor before crushing Cloud Keep. Cloud Keep’s offer presents Ryke and Errel with the opportunity to escape. For reasons unclear to Ryke, the two Green Clan messengers who brought the offer of truce are willing to help Ryke and Errel to flee. Refused sanctuary in the north, Ryke and Errol accompany the two messengers back south, beyond Istor’s reach. The wealthy south is very different land from the mountainous north. Although many of its ways are baffling to Ryke, who is not over-inclined to embrace novelty, with time he could have come to embrace them. But for his oaths to Errel, he could have settled down as a farmer or at worst a sell-sword. Feudal oaths forbid. Errel is determined to return to the north and claim his inheritance. Whither Errel goes, so must Ryke. Accompanied by the messengers Sorren and Norres, who have their own reasons to care about Tornor, lord and vassal head towards a final confrontation with Istor and his army. Istor isn’t an Evil Overlord despoiling all he touches. He’s no worse than the people who originally built Tornor Keep. In fact, he’s probably related to them. From a farmer’s perspective, Istor might be indistinguishable from the warriors from whom he took the keep. Somehow, when I read this almost forty years ago, I failed to notice the deplorable choices open to the vast majority of women. Ryke’s sister Becke is widowed when her man is killed defending the keep. The least bad choice open to her is to move into the tower to become Istor’s woman; she and her children have shelter and are fed, at the cost of making Becke a target for locals unhappy at being conquered. This isn’t Lynn playing the “how many rapes does it take to make my dragons realistic” game. The limited options northern women have (and the fact most of the men are so invested in this system that the idea women might object confounds them when the possibility is drawn to their attention) drives the messengers Sorren and Norres. Unwilling to pick one of a limited and unsatisfactory array of choices, they fled Tornor years ago to find better lives together. That will eventually have major consequences for the North. Modern readers might not appreciate the significance of the pairing, but in 1979 there weren’t a lot of fantasies with gay characters … or at least not positively portrayed ones1. Lynn establishes early on that the land of Arun doesn’t insist on heterosexuality. Whatever, you should do what you do. The catch is duty. Love whomever you like, but make sure to breed more soldiers to feed into Arun’s endless meatgrinder wars, not to mention more women to bear more soldiers. It’s a grim little setting but plausible. The manner in which Lynn handles the issue of the One True Heir was unusual for its time (it would be remarkable now, I suspect). So is her treatment of Ryke’s infatuation with another character … which goes nowhere in particular, because they are just not into him that way. It’s as though the simple fact of a man, even when they are the protagonist, wanting something does not entitle him to it. Very atypical for Disco Era secondary world fantasies. Watchtower is available here (Amazon) and here (Chapters-Indigo). 1: It’s quite unlikely that I will ever review a Horseclans novel (for many reasons). I do remember that the series featured an occasional gay character; such characters were invariably monstrous villains.The author had Issues.